No sauce needed with McCormick Grill Mates Barbecue Seasoning. Everything you need for great tasting barbecue is right in the bottle. Tomatoes, Natural Smoke Flavor, and seasonings all in one. No MSG added. With Grill Mates there is Flavor you can see! 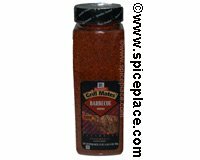 Ingredients: Brown Sugar, Salt, Spices (Including Red Pepper), Tomato, Garlic, Onion, Red Bell Peppers, Parsley, Extractives Of Paprika, Acetic Acid and Natural Hickory Smoke Flavor. McCormick®, Grill Mates®, and 'Flavor You Can See®' are registered trademarks of McCormick and Company, Hunt Valley, MD 21031.